Original Herb: sweetener (isomalt), extract (1 %) of Ricola’s herb mixture, colour (plain caramel), sweeteners (aspartame, acesulfame-K), natural mint flavouring, menthol. Eucalyptus: sweetener (isomalt), natural mint flavouring, extract (0.2 %) of eucalyptus and Ricola’s herb mixture, natural eucalyptus flavouring, menthol, sweeteners (acesulfame-K, sucralose), colour (chlorophylls). Lemon-Mint: sweetener (isomalt), acid (citric acid), extract (0.3 %) of lemon balm herb and Ricola’s herb mixture, natural citrus flavour, sweeteners (sucralose, acesulfame-K), natural mint flavour, menthol, colour (beta carotene). Nutritional values for 100 g: Energy value 990 kJ / 235 kcal; protein 0 g; carbohydrates 97 g, of which sugars 0 g; fat 0 g, of which saturated fat 0 g; protein 0 g; salt 0 g.
You can now get the three popular flavors Original Herb, Lemon Mint and Eucalyptus in a handy, resealable pouch. 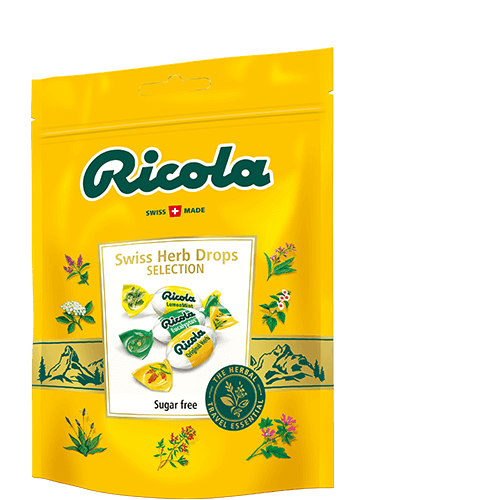 This clever stand-up pouch full of soothing and refreshing herb drops is part of Ricola’s Herbal Travel Essentials range, available exclusively in duty-free shops, to help travelers address their voice and throat problems during the journey.